I’ve been mulling over monsters for PARS FORTUNA the last couple of days – creating stats but also trying to figure out where they fit in to the larger scheme of “killing things and taking their stuff”. For most fantasy role-playing games, right back to the first, monsters were drawn from mythology, folklore and fantasy literature – you have the basic concept and you just apply some stats. As monsters are added, they slowly fill in some “ability gaps” – i.e. we have a monster that can hit, but maybe we need one that can hit AND is immune to fire. With PARS FORTUNA, the process is a bit different. The monster concepts come from random generators, but the stats do not, so right from the start I’m trying to figure out where a given monster fits in as far as how powerful it is, how it endangers the PCs and where it lives. And, of course, you want to do this in such a way that the beasties don’t just seem to have been stacked and sorted in a spreadsheet – you want them to live and inspire (probably too lofty a word, but it will work for now) and make the game experience enjoyable (I won’t say “fun” or the heavens may split and the hand of Raggi* may descend to smite me verily). Muscle – Your basic creature who kills you with weapons, sometimes a claw or slam, usually roughly humanoid, few (if any) special abilities – in other words (and to use Swords and Wizardry terminology) the Hit Dice and Challenge Level are usually the same. The main different between these creatures is the Hit Dice and maybe Armor Class and Damage – usually all ascending at the same time. This category has the axis of kobold – goblin – orc – hobgoblin – gnoll – bugbear – ogre, but also probably includes the minotaur and the simpler giants. Magic – The flip side of muscle, these guys have a big gap between Hit Dice and Challenge Level because they are really all about the special powers, which are usually magical. What these creatures lack in hit points they need to make up with difficulty in hitting, or the fights will be too short to be interesting. Here, you can file the dryads, nymphs and pixies, among others. Monsters – This category is just muscle + special attacks and defenses, physical and magical. The focus here is usually on a physical attack form (constriction, poison, etc) or maybe a magical power (petrification, confusion). They often have multiple attack forms, so unlike the muscle, which challenge with numbers, the monsters can take on a full party by themselves. These things can be humanoid, but usually are not. Things like chimeras, giant spiders and gorgons. Ubers – The uber category combines Muscle and Magic, and are often used as BBEGs in the game – rakshasas, hags, ogre magi, storm giants, etc. Of course, no little system, especially one so hastily assembled, can fit everything in, but it seems to me that these are the four bases to cover in monster design – you want a good variety of these kinds of monsters at different power levels to scale with the adventurers as they gain levels and keep each dungeon from being exactly the same – i.e. you would like multiple “monsters” for “mid-level” play, so the mid-levels of every dungeon don’t play quite the same. So – is there anything I am missing here? Let me know. 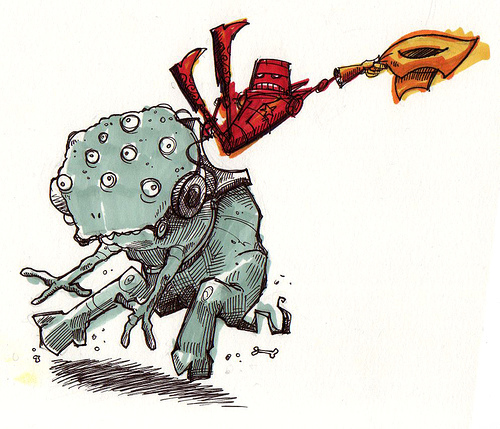 Art from Robots and Monsters, a charity website that produces custom-made drawings to help others. Check it out. * I think I’m adding a St. Iggar to NOD. Or maybe St. I-Gar. Hmmm…I can't think of any large group you haven't covered. “Closet trolls” – a type of 'puzzle monster'; creatures which are situationally deadly beyond their apparent power level, but are a pushover outside their niche. EG: the eponymous troll in a confined space (it can corner and melee you, rather than you kiting it with fire), giant octopi fought underwater (“What are the drowning rules again?”), kobolds in trapped labyrinths, Ogre Magi anywhere it can gaseous form hit-and-run, etc.